The Centre for Jazz and Popular Music at UKZN will present Gianni Denitto (Italy) on October 21. 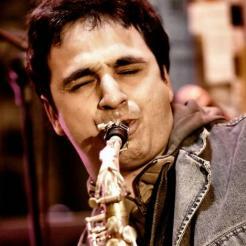 Gianni Denitto has a wealth of experience in jazz, classical, electronic, sound design and rock music. He completed a Bachelor Degree with honours both in classical music and in jazz after 11 years studying at the Conservatory in Torino, Italy. From 2013 he started traveling around the world playing his solo saxophone performance with electronics, as well as doing jazz concerts with local musicians and teaching in music academies and universities. Denitto is a proud artist of Universal Music Italy, Roland Europe, Rampone & Cazzani italian Handmade Saxophones and “One of the best Italian jazz musicians” according to the charts of “Musica Jazz” magazine. He has also collaborated with the Italian Institute of Culture in Beijing, Shanghai, Mumbai and Delhi, Pretoria; Italian Embassy in Beijing and Dakar; Calcutta, Perth and Canton Italian Consulates. The Durban leg of Denitto’s tour is sponsored by"LA DANTE" Italian cultural organization. Join Gianni Denitto (sax), with Mike Rossi (sax), Bruce Baker on drums and Prince Bulo on bass on October 21 at 18h00 at The Centre for Jazz and Popular Music (CJPM) Level 2, Shepstone Building, UKZN Howard College Campus.